We hope everyone is having a wonderful week so far. Today we want to introduce to you Bro. Shay Mann. 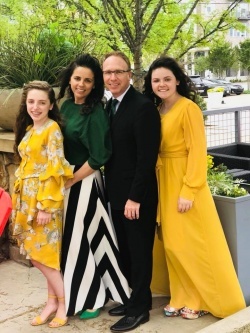 Shay Mann along with his wife Bridgette and their two daughters became pastor at The Life Church in Dallas, Texas in October of 2013. Prior to this, they spent twenty years pursuing their passion for student ministry. Over a ten year span, Shay served as Director of Promotion, General Youth Secretary and General Youth President for the United Pentecostal Church International. This season of organizational leadership was proceeded by ten years in the trenches filling the role of Youth Pastor in Atlanta, GA, and Texas City. InsideOut: If you were stranded on a deserted island, what three items would you want to have with you and why? SM: Since I have the Word of God hidden in my heart and wouldn’t be on the island long, I’d want a large case of water to keep me hydrated, a knife to help with building a shelter and for hunting/fishing and a satellite phone so I could call the Coast Guard to come rescue me. IO: Please tell us your favorite joke. IO: What is the funniest moment you have had while preaching? IO: Besides the Bible, what is your favorite book? SM: “The Holy Wild” by Mark Buchanan. For recreational reading, “The Last of the Breed” by Louis L’Amour. IO: What is your dream travel destination? SM: To stay in an over water bungalow in Bora Bora or to go snow skiing in the Swiss Alps. IO: What does your daily devotion routine look like? SM: I like to read a chapter from 4 different sections of the Bible (Old Testament, Psalms/Proverbs, Gospels/Acts and Epistles), proclaim a list of personal declarations and pray. IO: What is your favorite hobby/past-time? SM: Anything that involves being on the water. Boating, swimming, skiing. Even frozen water…snow skiing! IO: How do you prepare to preach to thousands at North American Youth Congress? SM: Really, the same way I prepare to preach in any other setting, except you have two years to stress (and have nightmares!) about it. IO: Briefly share your testimony, especially from your life as a teen. SM: I received the Holy Ghost and was baptized when I was 8 years old in the midst of a 100 soul revival at my home church. While I wasn’t perfect as a teenager, I always loved God and never really backslid. So my testimony is of all the damaging things that God saved me and kept me from! IO: When and where did God call you to preach, and how did you answer you His call? SM: It happened when I was a teenager in Jackson, MS. I can’t point to a specific encounter or say that I ever heard an audible voice. It simply started with a desire to be used of God and a burden to help connect people to Him. I wrestled with it initially and even resisted for a period of time. My youth pastor, David Reever, was instrumental in helping me through the process of embracing it. IO: What advice do you give to the teens and young adults of this generation? SM: Culture is constantly changing. Lines continue to get blurred. Anchor yourself to the truth that endures to all generations. IO: How can the students take the North American Youth Congress fire to their homes and home churches and keep it burning? SM: They’ve got to understand the value of events, but be willing to make the commitment of lifestyle. Daily is the operative word. When their relationship with God becomes daily, their impact will continually increase! BONUS: What is the greatest thing that has happened in your life beside salvation? SM: Marrying my beautiful wife, Bridgette!